[B,A] = designParamEQ(N,gain,centerFreq,bandwidth) designs an Nth-order parametric equalizer with specified gain, center frequency, and bandwidth. B and A are matrices of numerator and denominator coefficients, with columns corresponding to cascaded second-order section (SOS) filters. [B,A] = designParamEQ(N,gain,centerFreq,bandwidth,mode) specifies whether the parametric equalizer is implemented with second-order sections or fourth-order sections (FOS). Specify the filter order, peak gain in dB, normalized center frequencies, and normalized bandwidth of the bands of your parametric equalizer. Generate the filter coefficients using the specified parameters. Create a filter matrix compatible with fvtool. Design a second-order sections (SOS) parametric equalizer using designParamEQ, and filter an audio stream. Construct audio file reader and audio device writer System objects. Use the sample rate of the reader as the sample rate of the writer. Call setup to reduce the computational load of initialization in an audio stream loop. Design a SOS parametric equalizer. Construct a biquad filter System object. Construct a spectrum analyzer to visualize the original audio signal and the audio signal passed through your parametric equalizer. Play the filtered audio signal and visualize the original and filtered spectrums. Design a fourth-order sections (FOS) parametric equalizer using designParamEQ, and filter an audio stream. Design FOS parametric equalizer coefficients. Visualize the frequency response of your parametric equalizer. Play the filtered audio signal, and visualize the original and filtered spectrums. Filter order, specified as a scalar or row vector the same length as centerFreq. Elements of the vector must be even integers. Peak gain in dB, specified as a scalar or row vector the same length as centerFreq. Elements of the vector must be real-valued. Normalized center frequency of equalizer bands, specified as a scalar or row vector of real values in the range 0 to 1, where 1 corresponds to the Nyquist frequency (π rad/sample). If centerFreq is specified as a row vector, separate equalizers are designed for each element of centerFreq. Normalized bandwidth, specified as a scalar or row vector the same length as centerFreq. Elements of the vector are specified as real values in the range 0 to 1, where 1 corresponds to the Nyquist frequency (π rad/sample). Normalized bandwidth is measured at gain/2 dB. 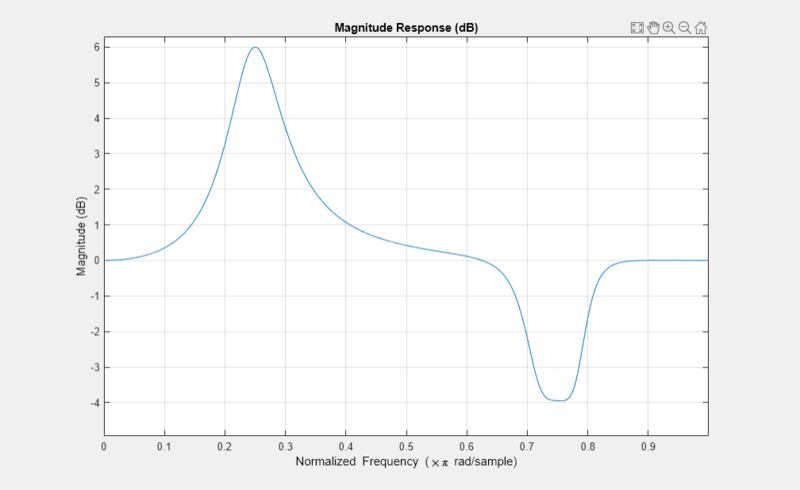 If gain is set to -Inf (notch filter), normalized bandwidth is measured at the 3 dB attenuation point: 10×log10(0.5). Design mode, specified as 'sos' or 'fos'. 'sos' –– Implements your equalizer as cascaded second-order filters. 'fos' –– Implements your equalizer as cascaded fourth-order filters. Because fourth-order sections do not require the computation of roots, they are generally more computationally efficient. Numerator filter coefficients, returned as a matrix. Each column of B corresponds to the numerator coefficients of a different second-order or fourth-order section of your cascaded equalizer. Denominator filter coefficients, returned as a matrix. Each column of A corresponds to the denominator coefficients of a different second-order or fourth-order section of your cascaded equalizer. A does not include the leading unity coefficient for each section.